I have just started studying a new course at Uppsala University, The Mask of Beauty. The course will provide me with tools to study the various ideals that has characterized the perception of the human body, the dress and beauty ideals in different historical eras. Even though the course has just begun it has already made me wonder if a news photo, like the one above, could be considered a portrait. It represents the “front” of a person – their gesture, expression, and manner – in such a way as to convey their distinct identity as well as to link him or her to a particular social milieu. The trial against seven former executives and directors of Saab Automobile, suspected of gross economic crimes, began today in Vänersborg, Sweden. The car manufacturer declared bankruptcy five years ago and the trial is the beginning of the closure of this nightmare. I was reporting live from the first day in court today. The former Saab officials face long prison sentences, if they are convicted. 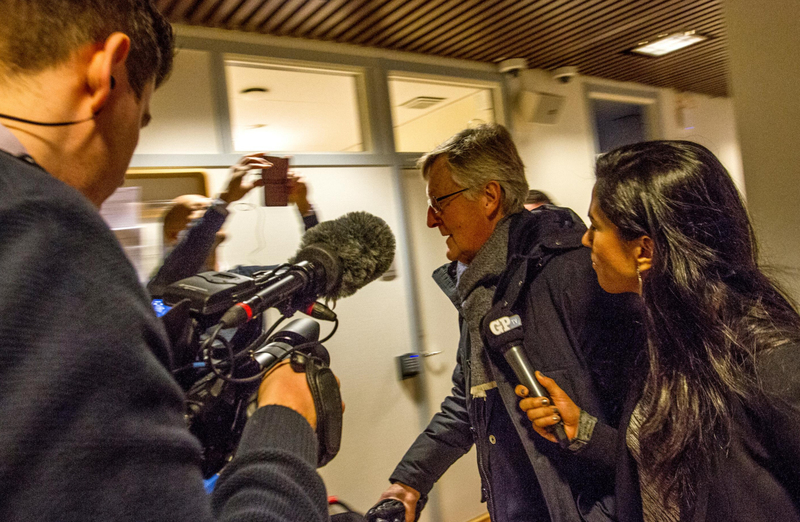 One of the accused is the bankrupt company’s former CEO, Jan Åke Jonsson. I would like to argue that the photo above could be regarded as a portrait. Even though it is taken on the run one can decipher quite a lot about Jan Åke Jonsson from it. The picture reveals that this is an important person, worthy of the media’s attention, besides from myself trying to interview him one can see a tv camera filming him, a person photographing him with a cell phone and of course the photographer that took the photo. One should also bear in mind that one can sense motion in the picture and that the above mentioned media personell were the ones present at this particular framing. One can also discern that this important man is refusing to dignify the Reporter (i.e. me) attempting to interview him with an answer. The Reporter’s jaw clenching indicates frustration over being ignored. His gaze is set afar, not even looking at the Journalist addressing him, and the apparent movement indicates flight. These signs indicate a man under distress. His attire is proper with an aire of casual elegance. The type of scarf and the way he has tied it give a hint of a posh expression. One can also tell he is wearing a blue blazer under his jacket. His hair is properly cut and neetly arranged. It is not possible to determine his age, but his gray hair indicate that he is probably a few years past middle age. The mentioned symbols combined with the subject’s expressions in this particular environment manage to convey the “front” of this man. He is in fact a prosperous 65-year-old man who’s reputation and life as a free man is hanging by a thread. His only option is to defend himself against the allegations upright and hope to be acquitted, in which case he can continue to lead a comfortable life. Knowing that this picture was taken in court further conclusions can be drawn by the fact that he is not hiding his face from the media, this trait is also associated with the previous mentioned fact that his future career depends on the dismissal of the charges. Seven people were ultimately charged accused of gross economic crimes. The charges include gross tax evasion, gross obstruction of tax inspection, gross racketeering, misrepresentation and gross forgery. Each separate crime is punishable by between four to six years in prison. The investigation has taken five years to be concluded. It has ben conducted by the Swedish Economic Crime Authority. The trial is scheduled for 23 days, the final negotiation day is March 29th. The same date that the production was halted for the first time in 2011 at the Saab Automobile factory in Trollhättan, Sweden. The verdict is expected later this year in May or June. This entry was posted in Blog, Economic Crimes, On Portraits, Saab Automobile, Sweden, Uppsala University and tagged Economic Crimes, On Portraits, Saab, Saab Automobile, Sweden, Uppsala University on 24th January 2017 by Cecilia Vaccari.